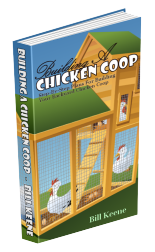 When you are homesteading and raising chickens you may want to caponize your chickens. To caponize a chicken means to neuter it. Neutering is done to make chickens fatter and more tender when they are slaughtered. 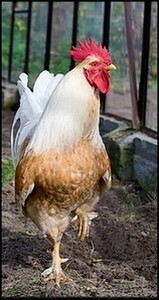 A capon is a male bird that has had its testicles removed. These organs are located just under the backbone, on either side, in line with the last 2 ribs. What is Caponizing and Why do It? Caponizing chickens is, in short, the surgical operation necessary for removing the testicles and neutering the chickens. Yes, you have to surgically remove the testicles. When this is done the bird can grow longer, gets larger and can also be used as a broody as their hormones are now that of a hen's. If you raise chicks in an incubator these capons make wonderful surrogate mothers once they hatch. However, the main reason for caponizing is because by doing so you get a beautiful eating bird. Which Chicken Breeds can be Used as a Capon? Any breed can be used as a capon. The traditional breeds are Orpingtons, Rocks and other duel purpose breeds. I have found that if you have discovered Silkie meat than this is one way to get a bit of meat on your Silkie. Silkies have black skin and black organs. The chemical that creates the black color also contains more vitamins and antioxidants than any other breeds of chickens. Caponized Silkies are becoming quite popular on the health market. If you have Bantam chickens caponzing will also plump up those little birds a bit. What is the Best Age to Caponize Chickens? The best age to caponize backyard chickens is from 6 weeks to 3 months. To start caponizing you need to either buy a caponizing kit from NASCO, or use a pair of hemostats and tweezers. An old method of caponizing chickens involves a straw with a horse hair running through it in a loop to lasso the testicle. Other methods of caponizing involve cutting a "V" into your pinkie fingernail and hooking them that way. You must be careful of anything sharp as there is a main artery that runs down the spine and if you cut that, you have lost your bird. I recommend practicing on a cockerel you have either recently killed or which has died. As a dead bird is a safe, first-practice bird, you certainly can't hurt it any. You will need to start the caponizing process by withholding food and water for about 24 hours. This keeps the swelling down and allows you to see what you are doing better as the gut and intestine are not full. You will also need to restrain the bird. I like the bow method myself. I have seen many techniques, that range from tying a string from the wings to one brick and the legs to another while the bird is lying on a table, the bricks are hanging off the edge. I have seen nails posted into a table and the strings tied to them. I like the bow method of caponzing as I can hold it anyway I want to and keep the tension where it is not painful to the bird, but tight enough that I can work. The bow is just that, a bow. You can use a green piece of willow and loop a string from around the base of both wings to the top part and tie the legs to the bottom part. Adjust the tension accordingly. Locate the second posterior rib, (last 2 ribs) and make an incision between them. Note the skin is stretched so when you release the bird the skin will cover the opening forgoing the need for stitches. When you make your incision you will have to spread the ribs carefully to see the first testicle. Books will tell you to remove the closest testicle first, however I advise you to remove the one furthest away first. The reason is some bleed, some don't but if they do bleed you can't find the second testicle. In this manner the removal of the closest one will not bleed onto your other one and you have a better chance of finding it and not damaging the artery along the spine looking for it. You will not have to cut these loose. They will simply come loose. Don't feel bad if you loose a few chickens when you first start out. It will happen. You won't loose a lot if you practiced on a freshly dispatched bird, however you will loose a few until you get the hang of it. After you get the hang of it you will be caponizing quickly and efficiently. I wish I had photos to show you however my camera was lost over the winter and I'm planning on finding it rather then buying a new one. I'm stubborn that way. Here is a link to a PDF online book that isn't complete but will give some photos and instructions. 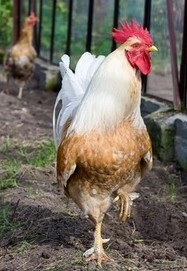 You can Add your Own Comments and Pages on Caponizing Backyard Chickens! We have lots of pages where you can contribute to throughout this website. We love hearing from our readers, and hope you will be one of those we hear from too. Look around our homesteading website. If you have any comments or questions, please feel free to contact us. When to Caponize and Cruelty Issues Regarding Caponizing. 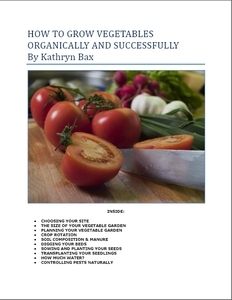 Yes, sign me up to receive my free e-Book "Growing Vegetables Organically and Successfully" When I sign up to receive the monthly homesteading newsletter.